1.1. What is a backup? 1.2. How do backups and restores work? This document describes how to deploy the OpenStack Block Storage Backup Service. The instructions herein are specific to an overcloud deployment. The OpenStack director can configure Red Hat Ceph Storage, NFS, and Object Storage (swift) as back ends. Google Cloud Storage can also be configured as a backup back end. This guide discusses procedures for creating and managing the Block Storage backup service. You can manage some features of the backup service using either the OpenStack dashboard or the command-line clients. Most procedures can be carried out using either method; some of the more advanced procedures can only be executed on the command line. This guide provides procedures for the dashboard where possible. 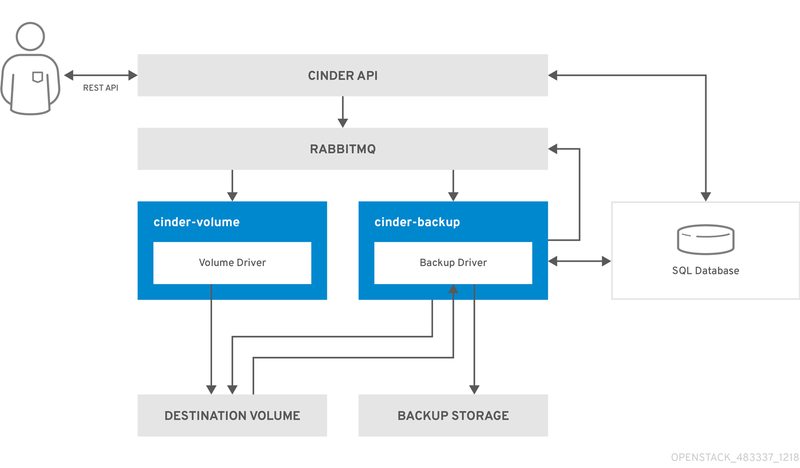 The Block Storage service (cinder) provides a horizontally scalable backup service that can be used to back up cinder volumes using diverse storage back ends. This service can be used to create full or incremental backups and to restore these backups. The service is volume-array independent. The Red Hat OpenStack Platform director is a toolset for installing and managing a complete OpenStack environment. The Red Hat OpenStack director orchestrates a functional, Enterprise-grade OpenStack deployment with minimal manual configuration. It helps address many of the issues inherent in manually configuring individual OpenStack components. The end-result OpenStack deployment provided by the director is called the overcloud. The overcloud houses all the components that provide services to end users, including Block Storage. The Block Storage backup service is an optional service deployed on controller nodes. This document provides guidance on how to deploy the overcloud’s Block Storage backup service to use a specific back end. This guide walks you through planning, installing, configuring, and using the Block Storage backup service. A volume backup is a persistent copy of a volume’s contents. Volume backups are typically created as object stores, and are managed through the OpenStack Object Storage service (swift) by default. You can, however, set up a different repository for your backups; OpenStack supports Red Hat Ceph and NFS as alternative back ends for backups. When creating a volume backup, all of the backup’s metadata is stored in the Block Storage service’s database. The cinder-backup service uses this metadata when restoring a volume from the backup. As such, when recovering from a catastrophic database loss, you must restore the Block Storage service’s database first before restoring any volumes from backups. This also presumes that the Block Storage service database is being restored with all the original volume backup metadata intact. If you wish to configure only a subset of volume backups to survive a catastrophic database loss, you can also export the backup’s metadata. In doing so, you can then re-import the metadata to the Block Storage database later on, using the REST API or the cinder client, and restore the volume backup as normal. For more information about volume snapshots, refer to the "Create, Use, or Delete Volume Snapshots" section of the Storage Guide. Volume backups and restores have similar workflows, illustrated below. When the Block Storage backup service performs a back up, it receives a request from the cinder API to backup a targeted volume. The request is completed and the backup content is stored on the back end. The diagram below illustrates how the request interacts with the cinder services to perform the backup. The client issues request to backup a Cinder volume by invoking the Cinder REST API (via the dashboard, client, etc.). The Cinder API service receives the request (from HAProxy) and validates the request, user credentials, etc. Creates the backup record in the SQL database. Makes an asynchronous RPC call to the cinder-backup service via AMQP to backup the volume. Returns current Backup record, with an ID, to the API caller. RPC create message arrives on one of the backup services. The cinder-backup service does a synchronous RPC call to get_backup_device. The cinder-volume service ensures the right device is returned to the caller. Normally, it is the same volume, but if the volume is in use, the service will return instead a temporary cloned volume or a temporary snapshot, depending on the configuration. The cinder-backup service issues another synchronous RPC to cinder-volume to expose the source device. The cinder-volume service exports and maps the source device (volume or snapshot) returning the appropriate connection information. The cinder-backup service attaches source volume using connection information. The cinder-backup service calls the Backup Driver, with the device already attached, which begins the data transfer to the backup destination. The volume is detached from the Backup host. The cinder-backup service issues a synchronous RPC to cinder-volume to disconnect the source device. The cinder-volume service unmaps and removes the export for the device. If a temporary volume or temporary snapshot was created, cinder-backup calls cinder-volume to remove it. The cinder-volume service removes the temporary volume. Once the backup is completed, the Backup record is updated in the database. The following diagram illustrates the steps that occur when a user requests that a Block Storage backup be restored. The client issues request to restore a Cinder backup by invoking the CinderREST API (via the dashboard, client, etc.). The Cinder API receives the request (from HAProxy) and validates the request, user credentials, etc. If the request didn’t contain an existing volume as the destination, the API will make an asynchronous RPC call to create a new volume and polls the status of the volume until it becomes available. The cinder-scheduler selects a volume service and makes the RPC call to create the volume. Selected cinder-volume service creates the volume. Once cinder-api detects that the volume is available, the backup record is created in the database. Makes an asynchronous RPC call to the backup service via AMQP to restore the backup. Returns the current volume ID, backup ID, and volume name to the API caller. The cinder-backup service makes a synchronous RPC call to cinder-volume to expose the destination volume. The cinder-volume service exports and maps the Destination Volume returning the appropriate connection information. The cinder-backup service calls the driver with the device already attached which begins the data restoration to the volume destination. The Google Cloud Storage driver is the only cloud driver supported by the Block Storage backup service. By default, the Google Cloud Storage driver uses the least expensive storage solution, nearline, which is meant for this type of backup. Updating configuration settings may improve performance. For example, if you are creating backups from Europe and you leave the backup default region (US), performance may be slower because you are backing up to a region that is a farther away. Google Cloud Storage requires special configuration that is explained in section Appendix A, Google Cloud Storage configuration. The table below compares pros and cons for cloud storage and local storage based upon the situation. Cloud storage is in another company’s data center and therefore automatically offsite. Access to data from many locations. Remote copy for disaster recovery. Requires additional planning and expense. Relies on the availability of another service and their expertise. Complete control over storage hardware. Requires management and expertise. Different pricing policies or tiers depending upon the services you use from the vendor. Known cost to add additional hardware as needed. Overall data access is slower and requires Internet access. Speed and latency depend upon multiple factors. Immediate and fast access to data. No Internet access required. The Block Storage backup service is optional. It is not installed by default and must be added to the overcloud deployment. An available storage source with a compatible backup driver: Object Storage (swift; default), Ceph, NFS, or Google Cloud storage. Google Cloud Storage requires additional configuration explained in Appendix A, Google Cloud Storage configuration. The examples in this section assume that you are deploying the backend service in a standard OpenStack environment that uses Pacemaker (default installation). The backup service is enabled by including the cinder-backup.yaml environment file, which resides in the /usr/share/openstack-tripleo-heat-templates/environments/ directory. The default settings in this file set up a swift back end for the Block Storage backup service with Pacemaker. The next step is to create a custom environment file, for example cinder-backup-settings.yaml, that contains the parameter settings for the backup service and configuration options for the driver. Create a copy of the cinder-backup.yaml file and store it in the same location as other custom templates. Modify the appropriate options for the backup back end that you are using (see instructions in the sections below). Swift is the default value for the CinderBackupBackend option. If you are using swift, no additional changes are needed. Swift is the default selection in the cinder-backup.yaml template. If you are using Red Hat Ceph Storage as a backup back end, then you have the option of changing the RBD pool name used for the backup. The default value is backups. Required. Change the value to ceph. Optional. No other settings need to be change unless you are using a custom RBD pool name. To use NFS as a back end for the backup service, you need to provide the NFS share to be mounted. Required. Set nfs as the value. Required. Enter the NFS share to be mounted. Default value is empty. Optional. Backup NFS Mount options can be left blank. If you need to specify mount options, include them here. Additional configuration options are described in Appendix A, Google Cloud Storage configuration. For more information, see the Including Environment Files in Overcloud Creation in the Director Installation and Usage Guide and the Environment Files section of the Advanced Overcloud Customization Guide. This chapter explains how to use the Block Storage backup service to perform full or incremental backups, and how to restore a backup to a volume. Basic troubleshooting tips are also provided. If you are using a Ceph volume backed up to a Ceph cluster, then the second time you do a backup, the backup service automatically performs incremental backups. You can create backups of volumes you have access to. This means that users with administrative privileges can back up any volume, regardless of owner. For more information, see Section 3.1.2, “Creating a volume backup as an admin”. KEYSTONEURL is the URL endpoint of the Identity service (typically http://IP:5000/v2, where IP is the IP address of the Identity service host). When performing this operation, the resulting backup’s size counts against the quota of TENANTNAME rather than the admin’s tenant. You can also export and store the volume backup’s metadata. This allows you to restore the volume backup, even if the Block Storage database suffers a catastrophic loss. You can also use the cinder backup-create command to create a backup of an in-use volume by adding the --force option. The --force option relies on Block Storage back end snapshot support and should be supported by most drivers. You can verify snapshot support by checking the documentation for the back end you are using. By using the --force option, you acknowledge that you are not quiescing the drive before performing the backup. Using this method creates a crash-consistent (but not application-consistent) backup. In other words, the backup will not have an awareness of which applications were running when the backup was performed. However, the data will be intact. When creating a backup from a snapshot, you can do a full backup or an incremental backup (by including the --incremental option). You must identify the volume ID associated with the snapshot. Locate the snapshot ID of the snapshot to backup using cinder snapshot list. The Block Storage backup service provides the option of performing incremental backups. Some backup features like incremental and data compression may impact performance. Incremental backups have a performance impact because all of the data in a volume must be read and checksummed for both the full and each incremental backup. Data compression can be used with non-Ceph backends. Enabling data compression requires additional CPU power but uses less network bandwidth and storage space overall. Multipathing configuration also impacts performance. If multiple volumes are attached without multipathing enabled, you might not be able to connect and might not be using the full network capabilities, which impacts performance. You can use the advanced configuration options (see Appendix B, Advanced Block Storage backup configuration options) to enable or disable compression, define the number of processes, and add additional CPU resources. Some back ends support creating a backup from a snapshot. A driver that supports this feature can directly attach a snapshot, which is faster than cloning the snapshot into a volume to be able to attach to it. In general, this feature can affect performance because of the extra step of creating the volume from a snapshot. By default, the cinder backup-create command creates a full backup of a volume. However, if the volume has existing backups, you can choose to create an incremental backup. Incremental backups are fully supported on NFS, Object Storage (swift), and Red Hat Ceph Storage backup repositories. Ceph backups currently ignore the --incremental option: Ceph backups always try to perform incremental backups when the source is a Ceph volume. Incremental Ceph backups can not be performed for non-Ceph volumes. An incremental backup captures any changes to the volume since the last backup (full or incremental). Performing numerous, regular, full backups of a volume can become resource-intensive as the volume’s size increases over time. In this regard, incremental backups allow you to capture periodic changes to volumes while minimizing resource usage. Replace VOLUME with the ID or Display Name of the volume you want to back up. To issue a backup cancellation on a backup, an admin must request a force delete on the backup. Even if the backup is immediately deleted, and therefore no longer appears in the listings, the cancellation may take a little bit longer. Check the status of the source resource to verify when the status stops being “backing-up”. Before OpenStack version 12, the “backing-up” status would always be stored in the volume, even when backing up a snapshot, so when backing up a snapshot any delete operation on the snapshot that followed a cancellation could result in an error if the snapshot was still mapped. Since version 13, ongoing restoring operation can be canceled on any of the supported backup drivers. Unlike most tenant storage quotas (number of volumes, volume storage, snapshots, and so forth. ), backup quotas cannot be modified through the dashboard yet. These steps create a new volume from a backup. The Volume ID should match the ID of the volume you want to restore. Typically, a Block Storage database loss prevents you from restoring a volume backup. This is because the Block Storage database contains metadata required by the volume backup service (openstack-cinder-backup). This metadata consists of backup_service and backup_url values, which you can export after creating the volume backup (as shown in Section 3.1.1, “Creating a full volume backup”). After the metadata is imported into the Block Storage service database, you can restore the volume as normal (see Section 3.5.1, “Restoring a volume from a backup”). The backup cancelation is an asynchronous action, as the backup driver needs to detect the status change before cancelling the backup. A change to “available” in the destination volume status means that the cancellation has been completed. This feature is not currently available on RBD backups. After a restore operation has started, if it is then cancelled, the destination volume is useless, as there is no way of knowing how much data, or if any, was actually restored. Many issues can be diagnosed by verifying services are available and looking in log files for error messages. 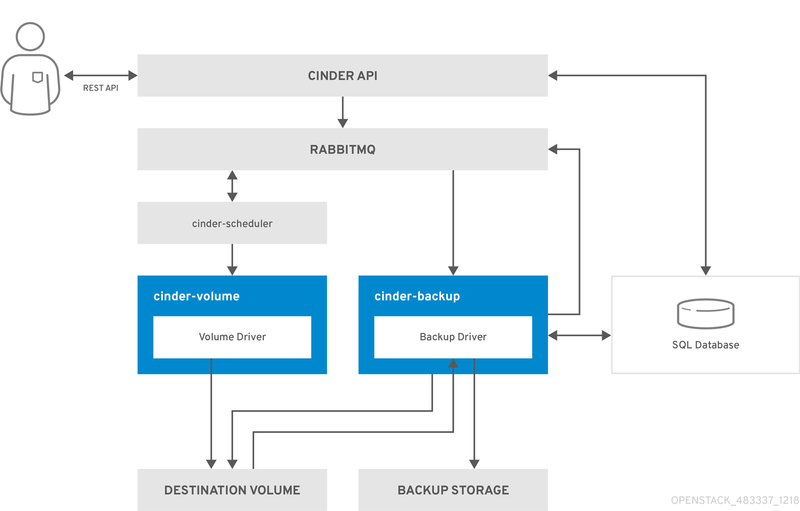 When the cinder-backup service starts up, it connects to its configured backend and uses this as a target for backups. Problems with this connection can cause service to be down. When backups are requested, the backup service connects to the volume service and attaches the requested volume. Connection problems here won’t be seen until backup time. In either case, messages describing the error should be present in the logs. For general information, log locations, and troubleshooting suggestions, refer to the Logging, Monitoring and Troubleshooting Guide. Log files and services are listed in the Log Files for OpenStack Services section. One of the first steps in troubleshooting is to verify that the necessary services are available and to check the logs for additional clues. Section 1.2, “How do backups and restores work?” illustrates the key services and their interaction. After you verify the status of the services, check the cinder-backup.log file. The Block Storage Backup service log is located in /var/log/containers/cinder]/cinder-backup.log. Use cinder show on the volume to see if it is stored by the host. Use cinder service-list to view running services. Verify that the expected services are available. Backups themselves are asynchronous. A relatively small number of static checks are performed upon receiving an API request. These checks include an invalid volume reference (missing) or a volume that is in-use or attached to an instance. The in-use case requires you to use the --force option. Using the --force option means that I/O will not be quiesced and the resulting volume image may be corrupt. If the API accepts the request, the backup will take place in the background. Usually the CLI will return immediately even if the backup has failed or is about to fail. The status of a backup can be queried using cinder’s backup API. If an error does occur, review the logs for the cause. The Block Storage backup service is deployed with Pacemaker by default. By configuring virtual IP addresses, containers, services, and other features as resources in a cluster, Pacemaker makes sure that the defined set of OpenStack cluster resources are running and available. When a service or an entire node in a cluster fails, Pacemaker can restart the resource, take the node out of the cluster, or reboot the node. Requests to most of those services are done through HAProxy. For information on using Pacemaker for troubleshooting, refer to the Using Pacemaker chapter of the Understanding Red Hat OpenStack Platform High Availability guide. 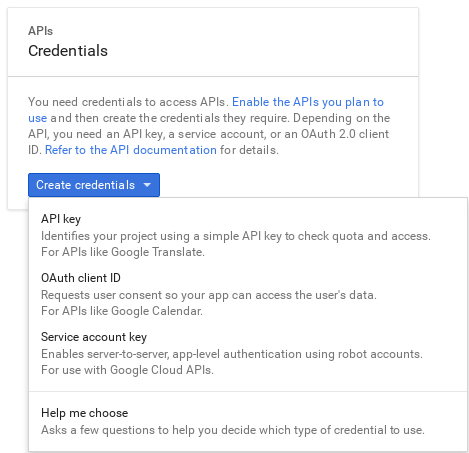 Creating and downloading the service account credentials of your Google account. Creating an environment file to map out the Block Storage settings required. This environment file will also use the service account credentials created in the previous step. Re-deploying the overcloud using the environment file you created. 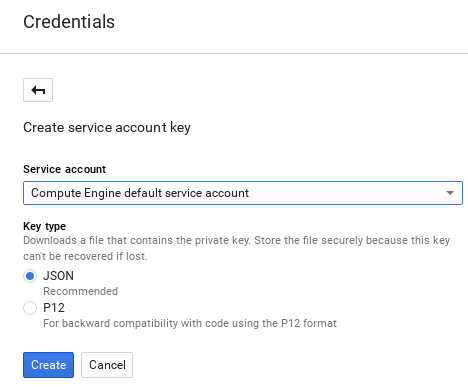 The Block Storage service needs your Google credentials to access and use Google Cloud for backups. You can provide these credentials to Block Storage by creating a service account key. Make sure to name the file Cloud-Backup.json and do not change the file name. This JSON file needs to be in the same directory location as the [filename}`cinder-backup-gcs.yaml` file created in the next section. Using the example file provided, create the cinder-backup-gcs.yaml file. The white space and format used in this the example (and in your file) are critical. If the white space is changed, then the file may not function as expected. Copy the text below, paste it into the new file. Do not make any modifications to the file contents. Save the file as /home/stack/templates/cinder-backup-gcs.yaml. Use the example environment file below and update the backup_gcs_project_id with the project ID listed in the Cloud-Backup.json file. You may also wish to change the backup_gcs_bucket_location location from US to a location closer to you. See the Google Cloud Backup Storage backup back end configuration options table for a list of options. Copy the environment file example below. Make sure to retain the white space usage. Change the value for backup_gcs_project_id from cloud-backup-1370 to the project ID listed in the Cloud-Backup.json file. Each setting is defined in the environment file. Available options are explained in the table below. Required. The project ID of the service account you are using, as noted in the project_id of the service account key from Section A.2, “Creating the GCS credentials file”. The absolute path to the service account key file you created earlier in Section A.2, “Creating the GCS credentials file”. Log in as the stack user. Restart the cinder-backup service after the deployment finishes. Prior to director-deployed installations, the cinder.conf file was used to configured the Block Storage service and the backup service. When a value from cinder.conf does not have a Heat template equivalent, the values can still be passed from director using a custom environment. The values are added to an ExtraConfig section in the parameter_defaults section of a custom environment file (like cinder-backup-settings.yaml). ExtraConfig provides a method for additional hiera configuration to inject into the cluster on all nodes. These settings are included on a dedicated backup node, for example, if you used ExtraConfig. If you used ControllerExtraConfig instead of ExtraConfig, then those settings would only be installed on controller nodes and not on a dedicated backup node. You can substitute DEFAULT/[cinder.conf setting] for the setting that would be used in the DEFAULT section of the cinder.conf file. The example below shows how the ExtraConfig and entries appear in a YAML file. The options below provide a sample of the backup-related options. Offload pending backup delete during backup service startup. If false, the backup service remains down until all pending backups are deleted. Attach volumes using multipath, if available, during backup and restore procedures. This affects all cinder attach operations, such as create volume from image, generic cold migrations, and so forth. The maximum number of times to rescan targets to find volume during attach. Number of backup processes to run. Performance gains will be significant when running multiple concurrent backups or restores with compression. Size of the native threads pool for the backups. Most backup drivers rely heavily on this. The value can be decreased for specific drivers that don’t rely on this option. (String) Custom directory to use for backups. Enable (true) or disable (false) the timer to send the periodic progress notifications to Ceilometer when backing up the volume to the backend storage. Comma-separated list of options to be specified when mounting the NFS export specified in backup_share. (String) Base directory containing mount point for NFS share. The compression algorithm to be used when sending backup data to the repository. Valid values are zlib, bz2, and None. Data from cinder volumes larger than this will be stored as multiple files in the backup repository. This option must be a multiple of backup_sha_block_size_bytes.